Nine days ago, I was sent the premiere of Jesse Ventura’s ‘Conspiracy Theory’ about Plum Island Animal Disease Center off of Long Island, New York. The Plum Island program made for some very entertaining and sensational television that left many questions unanswered, and it is actually worth watching because of the very questions raised including the Montauk Monster, Erich Traub’s research with ticks, and Lyme Disease. I have spent hours trying to independently substantiate Ventura’s claims with more than one reliable source. I have not been able to accomplish that, but I did come across the end of one string that Mr. Ventura’s team did not cover in any depth. On June 1, 2003, control of Plum Island was transferred from USDA to the Dept. of Homeland Security. In January, 2006, DHS began site selection for the new National Bio and Agro Defense Facility even though, at that time, it was illegal to introduce live foot and mouth disease virus on the mainland. Provided, That no live virus of foot-and-mouth disease may be introduced for any purpose into any part of the mainland of the United States (except coastal islands separated therefrom by water navigable for deep-water navigation and which shall not be connected with the mainland by any tunnel) unless the Secretary determines that it is necessary and in the public interest for the conduct of research and study in the United States (except at Brookhaven National Laboratory in Upton, New York) and issues a permit under such rules as the Secretary shall promulgate to protect animal health, except that the Secretary of Agriculture may transport said virus in the original package across the mainland under adequate safeguards, and except further, that in the event of outbreak of foot-and-mouth disease in this country, the Secretary of Agriculture may, at his discretion, permit said virus to be brought into the United States under adequate safeguards. To carry out the provisions of this section, the Secretary is authorized to employ technical experts or scientists: Provided, That the number so employed shall not exceed five and that the maximum compensation for each shall not exceed the highest rate of grade 18 of the General Schedule. There is authorized to be appropriated such sums as Congress may deem necessary; in addition, the Secretary is authorized to utilize in carrying out this section, funds otherwise available for the control or eradication of such diseases. Where does DHS decide to put a (now) $650 million dollar lab (employing 300) with several live zoonotic pathogens? Why, of course, the heart of ‘Tornado Alley’ at Kansas State University in Manhattan, Kansas, where the economic fallout from an escaped bug will be the greatest (not to mention the human and animal toll). 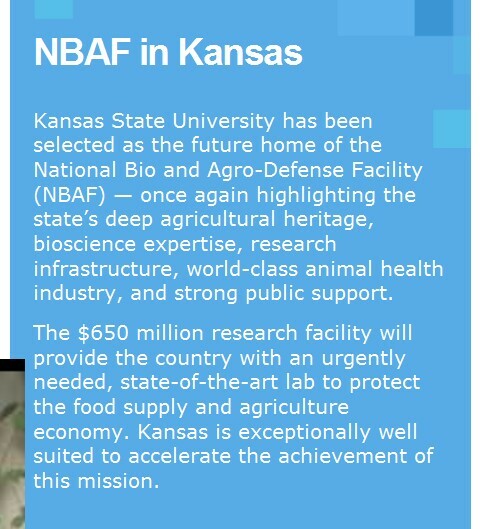 NBAF in Manhattan, Kansas, will be a state-of-the-art biocontainment facility for the study of foreign animal, emerging and zoonotic (transmitted from animals to humans) diseases that threaten the U.S. animal agriculture and public health. NBAF will provide and strengthen our nation with critical capabilities to conduct research, develop vaccines and other countermeasures, and train veterinarians in preparedness and response against these diseases. For the past 50 years, the Plum Island Animal Disease Center (PIADC) has served our nation as the primary facility to conduct this research. However, PIADC is nearing the end of its life-cycle and needs to be replaced in order to meet U.S. research requirements and ensure the timely development of countermeasures in the event of an outbreak. NBAF meets that need and will serve as a replacement for the PIADC facility. Strategically, NBAF will boast of new and expanded capabilities, specifically, Biosafety Level (BSL) 4 containment for the study of high-consequence diseases affecting large livestock. NBAF rests on a strategic partnership between the Department of Homeland Security and USDA. These agencies set research priorities based on threats to animal agriculture, and conduct risk assessments, gap analysis and other necessary evaluations to protect our nation from threats to our animal agriculture and public health. Within the facility, The Department and USDA will continue the work of PIADC at NBAF to conduct research, diagnostics, vaccine development and testing, and training in preparedness and response for veterinary and animal agricultural specialists. Do we really want any of these pathogens floating around the mainland? And what does the Government Accounting Office think of DHS’s assessments as to the safety of NBAF in Manhattan? According to DHS, risk characterization should bring together all the critical information from its analyses on hazard and accident scenarios, plume modeling, and economic impact to present a comprehensive picture of the risks an NBAF’s operation would pose. However, DHS did not effectively integrate all the critical information from its analyses to characterize the differences in risks between the mainland and island sites. DHS’s EIS and threat and risk analyses showed very little differentiation in the risks across the six sites. Although the EIS hazard and accident analyses identified several factors that differed, such as the sites’ proximity to livestock, in the final rankings they were not considered significant. DHS also concluded that security vulnerabilities that the threat and risk analyses identified would be the same for all sites, regardless of location. However, DHS asserted that both the site-independent and site-specific vulnerabilities could be mitigated by incorporating improvements. DHS therefore considered the identified security risks at all sites to be acceptable. an NBAF at any site. Site-independent factors therefore did not differentiate between island or mainland sites. plume modeling results, and the likelihood of any disease spreading from the island (see table 5). The EIS showed that Plum Island’s lack of animals placed it at an advantage with respect to the likelihood that FMD virus would become established after being released and spread from the site. In contrast, all the other sites are in areas where the virus would have ample opportunity to spread rapidly after release because of the presence of susceptible livestock and wildlife.43 Further, the EIS showed that for all sites except Plum Island, the wind could potentially transport viral pathogens significant distances and that this pathway is not limited for them, as it is on Plum Island. 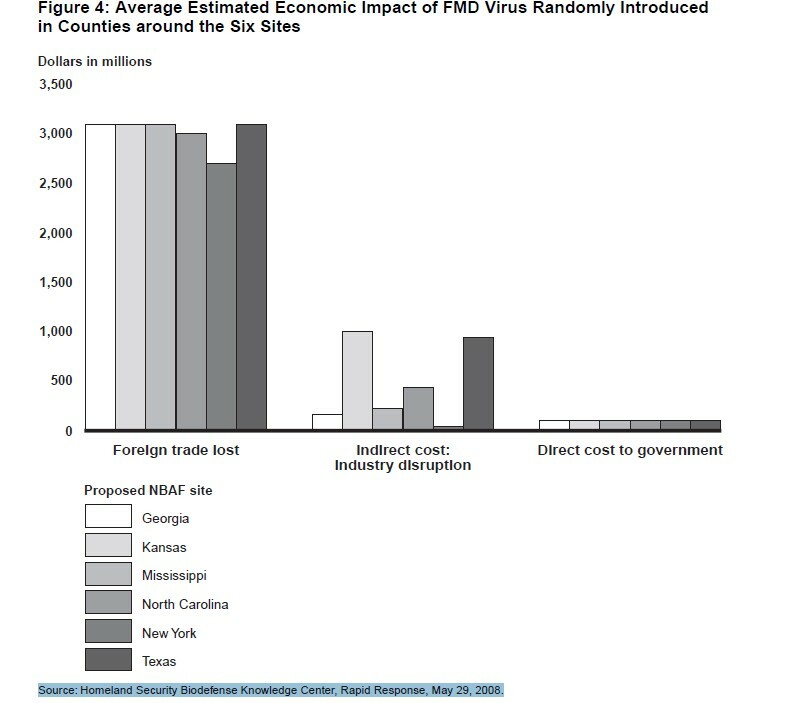 Given the significant limitations in DHS’s analyses that we found, the conclusion that FMD work can be done as safely on the mainland as on Plum Island is not supported. DHS’s response to the GAO report? DHS and USDA have determined that foot-and-mouth diseases (FMD) research can be safely studied on the mainland, and fully support the decision to construct and operate the NBAF at the Manhattan, Kansas, site. While the study of contagious diseases anywhere is not without risk, modern biocontainment technology has made the likelihood of an accidental release of a pathogen extremely low. Modern biocontainment technology has eliminated the need for locating animal-disease research on an island as was done decades ago. The fact that live FMDV research is already being performed on the mainland in other countries should not be dismissed by the GAO, as it clearly demonstrates that such work can be conducted safely on the mainland (with appropriate biosafety and biosecurity protocols in place to minimize the risk of release). There are five BSL-4 facilities currently operating in the United States in populated areas (Centers for Disease Control and Prevention [CDC] and Georgia State University in Atlanta, Georgia; U.S. Army Medical Research Institute of Infectious Diseases [USAMRIID] at Ft. Detrick, Maryland; University of Texas Medical Branch [UTMB] in Galveston and Southwest Foundation for Biomedical Research [SFBR]in San Antonio, Texas). There has never been a public exposure resulting from research at a BSL-4 laboratory in the United States. DHS is committed to minimizing both the likelihood and the consequences of the release of any pathogen. DHS has further determined that there are significant benefits to constructing the NBAF on the mainland, including rapid diagnosis and response to possible foreign animal disease outbreaks, and access to more research programs and expertise which will allow greater research advancements. DHS appreciates the independent review conducted by GAO, and takes seriously the observations made in the draft report of the consequences of a pathogen release. As part of the design process, DHS will conduct a site-specific biosecurity risk mitigation assessment for the Manhattan, Kansas site to determine the required facility design and engineering controls needed to adequately protect NBAF during operations. Risk mitigation assessments will include modeling scenarios to assist in developing a detailed emergency response plan to prepare city, state, and regional officials in the extremely unlikely event of a pathogen release. In response to the observations made by GAO in the draft report, the modeling will incorporate site-specific and regional-specific data. As a final matter, DHS also notes that the draft GAO report is unresponsive to the direction of the Congress. Instead of evaluating if foot-and-mouth disease (FMD) research “can be done safely on the mainland” per Congressional direction in P.L. 110-329, GAO instead chose to evaluate whether FMD research can “be done as safely on the mainland as on Plum Island.” DHS stated in the NBAF EIS that the water barrier around Plum Island would provide anadditional layer of protection in the extremely unlikely event of an accidental release of any pathogen proposed for study at NBAF. DHS determined, however, that the Plum Island site did not best meet the purpose and need to site, construct, and operate the NBAF based on the Research, Workforce, Acquisition/Construction/Operations, and Community Acceptance site evaluation criteria developed by a team of Federal employee DHS and USDA subject matter expert. There is also strong political opposition at Federal, state, and local levels to having BSL–4 research performed on Plum Island. Ultimately, it is not the location that determines the risk but the design and operation of the new facility. As discussed later, a site-specific biosecurity risk mitigation assessment will be conducted as part of the ongoing design process. Equally important, the use of state-of-the-art operating procedures and biocontainment technology will be employed in the NBAF, which will greatly enhance the ability to conduct crucial foreign animal disease research anywhere in the United States. Silly little humans trying to tell a Kansas Class 5 Super Tornado about risk and location. Kansas will have the greatest disruption to the cattle industry of any of the sites according to DHS no less. DHS is ‘technically’ not breaking the law, yet this looks like another instance where “Big Government” just knows better than us. But of course, build it in the heart of tornado country, put it under the pervue of DHS, and when it is blown to the four corners of our country, bring in Martial Law to corral the survivors and burn the dead. Could there be a better setup? You see, these are psychopaths, they dream up ideas not realizing that NORMAL people can see the absurdity of it (as in finding two terrorists passports in the rubble of the collapsed trade center buildings within a day of the bombings). Or a crater created on 9/11 supposedly from a crashed jet in the middle of a field in PA, but with barely any debris, no bodies, and no luggage (in all your life, have you ever heard of a vaporized crash site?). It’s all as ridiculous as a Godzilla movie from the 1950s. I digress, but probably you get my point. And the only way they get away with these things is because they have all the toys and money, and are dealing with an American public that has been dumbed down by fluoride and pharmaceutical drugs to the point they don’t get alarmed or question much of anything. Great work, DT. they probably want to put it there so they can set the viruses loose all over the country to kill many of us. Isn’t a US Code a law? It says that it has to be on an island with deep water and no tunnels. Aren’t they breaking the law by putting it there and the other facilities in the other states? The DHS needs to be abolished. It should never have been established. Of course, who would have believed this whole government would have gotten to corrupt? They were breaking the law up until 2008 when they had Congress pass a law that included the direction for the Sec. of USDA to give them permission to move it to the mainland. They started site search in 2006 and then found out about US Code 21. 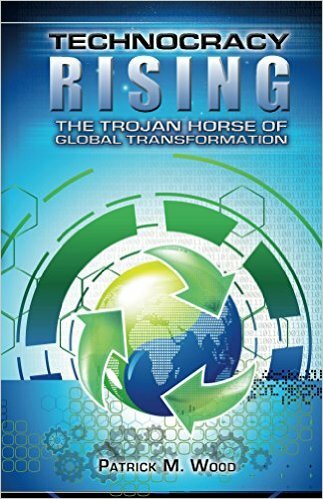 I also thought they were breaking the law but after reading numerous pages from the GAO – I found that they are walking the tightrope. Does it make it right or sane? Nope. But what can you expect from global progressives who are smarter, faster, prettier, and all around just better people than us? Of course, they put it i Kansas, why not, The winds will carry everthing East towards the heavy populated East Coast. Not to mention the fact that Manhattan was hit by a tornado 2 or 3 years ago. Those in Kansas need to review the requirements of NEPA and have every elected body in the area require that DHS coordinate with the local agencies. They must do a proper EIA then conform their plans to the local communities’ plans. Through NEPA and using COORDINATION, the locals are on an equal footing with the offending state of federal agency. It’s not easy, but that is what was done to stop the trans Texas corridor. I recorded my DVD “Global Warming, What The Government Isn’t Telling You” in the early Spring of 2008. In it, I mention the Plum Island Research Facility being moved to Kansas. I had been talking about this matter for nearly a year before that. Plum Island will be under water in the very near future. That’s the real (and only) reason for moving it. Oh yes, we don’t have until 12/21/2012. Stumpy – I’m not worried about FMD; I’m worried about the other pathogens that they are working with that do jump the animal/human barrier. I like your suggestion about running down the patent – doing that right now. Thanks!